The cash budget summarizes all your cash inflows and outflows for the period, adding cash receipts and subtracting cash payments. Positive cash projections assure you that your company will have enough cash to make it through the next period. If your cash budget comes out negative, though, you may have to start all over again from the beginning. Do not pass go, do not collect $200. Before you can prepare a cash budget, however, do some homework to estimate cash receipts and cash payments. Some customers pay their bills quickly, but others take advantage of the credit you give them, paying more slowly. This delay means that predicted sales, as enumerated in the production budget, don’t always immediately translate into cash flows. Forever Tuna’s accountants estimate that, on average, the company collects 40 percent of sales in the same month as the sale, 35 percent in the following month, and the remaining 25 percent two months after the sale. The company had $230,000 worth of accounts receivable on December 31, 2013, of which it collected $155,000 in the first quarter and the remaining $75,000 in the second quarter. Here is a schedule of expected cash receipts, which computes when the company expects to receive payments for each quarter’s sales. 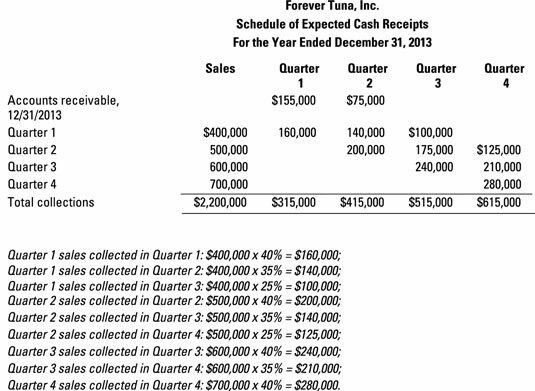 The schedule of expected cash receipts indicates that Forever Tuna will probably receive $315,000 from its customers in the first quarter; $415,000 in the second quarter; $515,000 in the third quarter; and $615,000 in the fourth quarter. Just as you give customers the luxury of paying their bills over several quarters, so too do your suppliers probably give you time to pay yours. 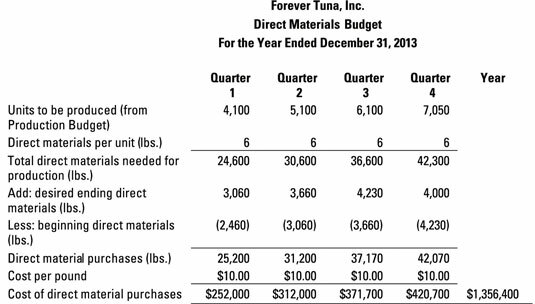 Forever Tuna’s policy is to pay half its accounts payable in the same quarter as the purchase and half in the following quarter. The company pays 75 percent of its S&A expense in the same quarter and 25 percent in the following quarter. The company had $105,375 worth of accounts payable on December 31, 2012, and paid that entire amount in the first quarter of 2013. The direct materials budget provides the amount of direct materials that the company plans to purchase next year. The S&A budget indicates how much the company plans to spend on S&A. 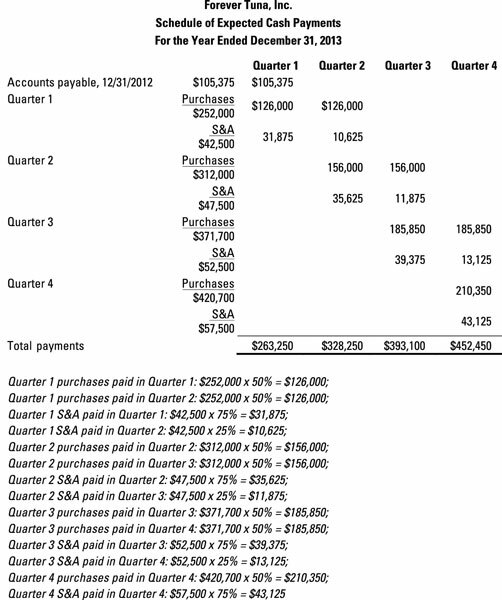 For the company’s schedule of estimated cash payments, look at this figure, which computes the payments to be made for purchases and S&A next year. 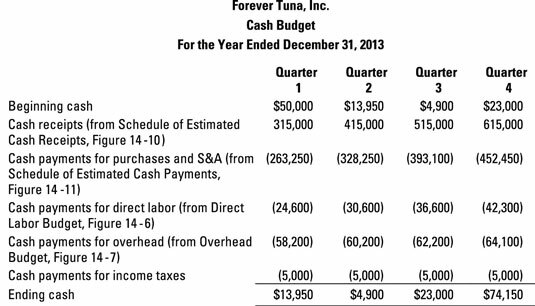 This schedule of expected cash payments indicates that Forever Tuna expects to pay $263,250 in the first quarter; $328,250 in the second quarter; $393,100 in the third quarter; and $452,450 in the fourth quarter for purchases and S&A. To prepare a cash budget, combine information about every cash inflow and outflow from the schedule of estimated cash receipts, the schedule of estimated cash payments, and any other budgets that involve cash flows (such as the direct labor budget, the overhead budget, and/or income tax payment info). Forever Tuna must pay for direct labor and overhead, which it does immediately, as incurred. The company also must make quarterly income tax payments of $5,000. It started the year with $50,000 worth of cash. The cash budget culminates this project. Note how the amount of ending cash at the bottom of each column of the budget rolls forward to become beginning cash in the next quarter (at the top of the budget). This cash budget indicates that Forever Tuna sure is cutting it close. Although the company starts with $50,000 worth of cash, its cash reserves drop to $5,800 by the end of the second quarter. This reserve level means that an error or some unexpected cash payment greater than $5,800 would cause the company to run out of cash in the middle of the year.